We know that pictures can say a thousand words, but can speaking mean more than what’s pronounced? Poetry is writing that is focused on expressing feelings and emotions through the power of words, let it be read or spoken. Through grade school, teachers have taught various versions and forms of poems, encouraging kids to try this different form of language. Most of the time, the emphasis is on the consonant rhythm and rhyme. Various emotions, however, are evoked by the way one reads a poem aloud. Marissa Dadiw, a fourth year at University of California, Santa Barbara, majoring in literature and feminist studies, examines the meaning in sounds of the poems opposed to the actual literal meaning. The CLAS tutor held a workshop in the Student Resource Building on Thursday, April 16, exposing students to a unique way of looking at poetry. “The way each word sounds can dictate the way a poem is perceived,” said Dadiw. 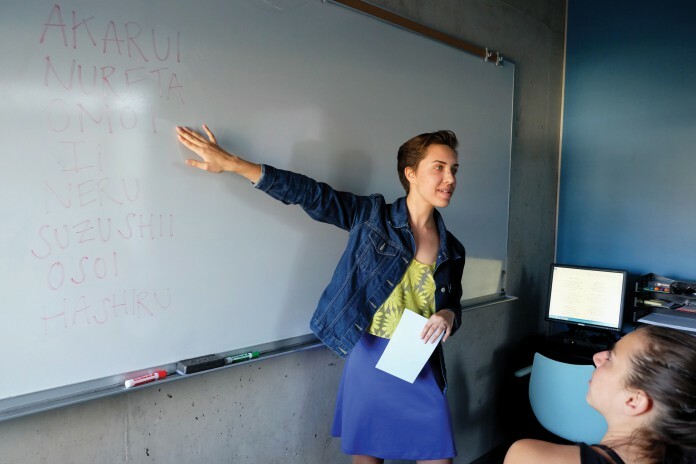 To start off, students were introduced to a set of Japanese words. Since not everyone understood the meanings, the task was to say the word and listen to the way it was said. The perceived sound was then used to determine what the actual meaning was between a set of antonyms. Some examples include words like “akarui” and “nureta”, which mean bright and wet respectively. Dadiw emphasized how certain aspects of the enunciation symbolize the meanings, most notably the sharp “rui” sound at the end of “akarui,” and long “ur” in “nureta.” Small details like these typically pass through our mouths without too much thought, and this is exactly the type of effect some poets like to sneak in. Next, Dadiw revealed introduced writer Sylvia Plath’s poem “Medusa” and played a tape recording of Plath herself reading it in a presentation. Upon first impressions, students were asked to discuss what sort of mood and emotion certain lines seemed to display through words. After analyzing and pointing out many examples of Plath’s clever use of sharp tones and long, soft, and hard consonance tunes, it was evident that words such as “dragging” and “landspit” used onomatopoeia to support their literal meanings. In the end, students were asked to create meaningful messages by using words that form an emotion through sound, whether the literal meanings made sense or not. This task proved to be both tough and easy, depending on what words were used, what kind of feelings were on the mind, and what message was to be conveyed.